Hyperdoc Story Creator Using Google Docs! Can you believe I never knew digital education interactives were called Hyperdocs? Apparently a Hyperdoc is the official name of a digital interactive created by using Google APPS for Education. So what is a Hyperdoc? A Hyperdoc is a Google Doc which contains information and directions delivered by using data objects. The data objects are presented by hyperlinks to context outside of the Google Doc. This provides the student with independent time to explore a new topic. Here is an example of a “Story Creator” Hyperdoc. Why use a Hyperdoc in the classroom? Supports the students with independently following directions. Saves time by limiting the amount of times a teacher as to repeat questions. Can provide opportunities of exploration as students learn a topic. Provides the quiet student with a voice. Differentiates activity so all students can participate. Teachers have the opportunity to synchronously check student’s work and make sure they’re following guidelines. Teachers can access the revision history to help evaluate the content. Provides extra opportunities for supporting the struggling student. Creates opportunities for guiding the excelled student towards more challenging material. 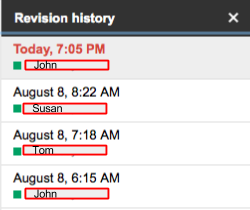 How do you check the revision history?